Muslims also refused to bury the man who killed the priest, saying he'd tainted Islam and wasn't a Muslim. 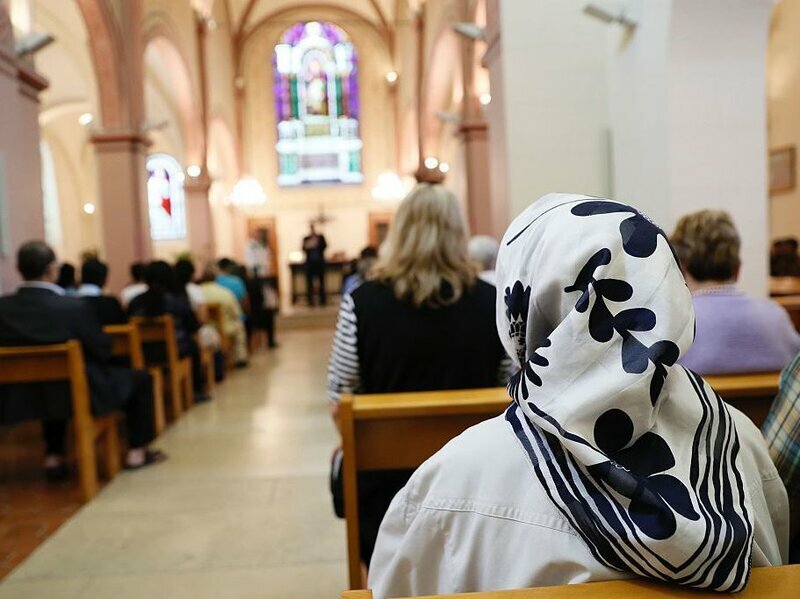 In a show of solidarity, Muslims across France are attending Catholic Mass on Sunday after the brutal murder of a priest. Two men attacked a church in the small town of Saint-Étienne-du-Rouvray near Rouen on Tuesday, and slit 85-year-old Jacques Hamel's throat, as we reported. The attack was later claimed by the Islamic State through its Aamaq news agency. As AFP reported, the French Muslim council CFCM called for the gesture "to show their 'solidarity and compassion' over the priest's murder." "We are all Catholics of France," said CFCM head Anouar Kbibech, according to the BBC. There was a particularly strong turnout at the cathedral in Rouen, near the site of the attack. "We are very moved by the presence of our Muslim friends and I believe it is a courageous act that they did by coming to us," Rouen's archbishop Dominique Lebrun said following the service, as the Associated Press reported. "Outside the church, a group of Muslims were applauded when they unfurled a banner: 'Love for all. Hate for none.' "
As AFP reported, a particularly moving moment occurred during the sign of the peace — the portion of the mass where the congregation members greet each other. "Archbishop Lebrun used the moment to step into the congregation and greet Muslim leaders attending, as well as three nuns who were at the church in Saint-Étienne-du-Rouvray when Hamel was murdered," as the wire service reported. "For me, it is very important to be here today," Mohammed Karabila, president of the mosque in the town where Hamel was killed, told the BBC. "Today we wanted to show physically, by kissing the family of Jacques Hamel, by kissing His Grace Lebrun in front of everybody, so they know that the two communities are united." 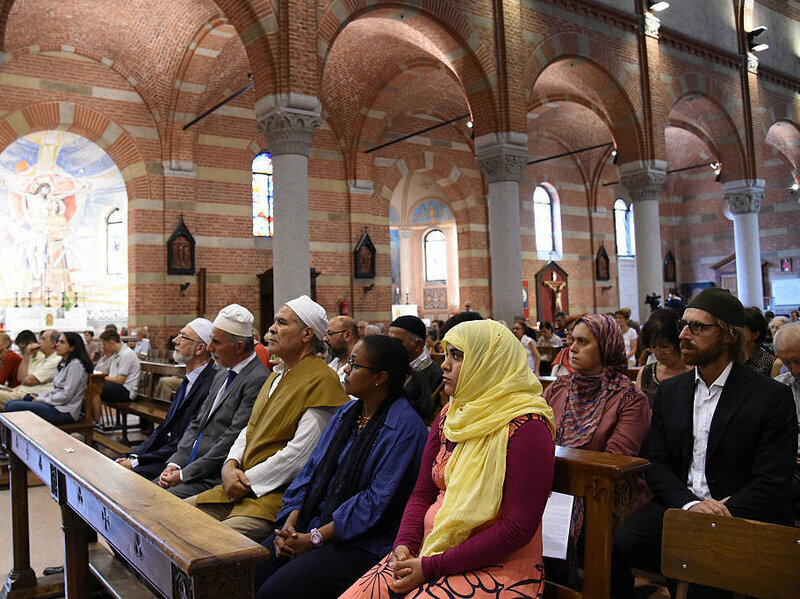 A Muslim delegation also attended Mass in Nice, the city where an attacker plowed his truck into a crowd celebrating Bastille Day earlier this month, killing 84 people. "Being united is a response to this act of horror and barbarism," said Otaman Aissaoui, Nice's top imam, according to AFP. The wire service reports that Paris and Bordeaux also saw Muslims attending mass. The BBC reports that Muslim leaders attended mass in Italy, where "three imams sat in the front row at Santa Maria Trastevere church in Rome." A woman I'd worked with, who'd never been to India, was upset when once I prepared to leave for India and couldn't give her an address where she could reach me there. But what if something bad happens to you? How will I find you if I go searching for you there? I was touched by her deep concern for my welfare, that she would think of ripping her life apart and spend money she couldn't afford to search for me in a distant land. I replied with a laugh, "Oh that's easy. Get on a bus -- "
"Any bus, doesn't matter -- "
"Doesn't matter. Just get on a bus and pray to find me. While you're on the bus, there will be an accident. Not a big accident, nobody hurt. But it will stop traffic. People will get out of vehicles to see what's happening. And there I'll be." Years later this woman got herself into trouble and didn't know what to do, except to run away. While on the run it occurred to her that I would know what to do, but I had moved away and all she knew was that I was living somewhere in northern Virginia, which she'd never visited. Then she remembered what I'd told her so long ago about how to find me. So she left New York on a bus and this woman -- a lapsed Roman Catholic who'd turned against God -- began praying like mad. She got off the bus at a station in Virginia. Then she asked where she could find a local bus to northern Virginia. When the station manager asked where in northern Virginia, she asked him to name various places there, then randomly chose and rode to the end of the line. She got off the bus and aimlessly walked a short distance, then stopped in astonishment. There I was. "How?" she asked when she could find her voice. "Indian time," I answered. "I live on Indian time." For those of you who are interested in such things I offer the following observations concerning today's Syrian situation. The R+6 [coalition of forces with Syrian Army] encirclement of East Aleppo grows ever more solid. All counter-attacks intended to break the cordon have failed. South Front thinks that the next SAA [Syrian Arab Army] move will be to try to take Kafr Hamra just outside the encirclement to the NW. Evidently the rebels have been using this place for firing positions for indirect harassing fire into the government and YPG south of Kafr Hamra. It is easy to see why they would want to do that but they should expect this effort to be a focal point for more counter-attacks. There will be other counter-attacks intended to break through to East Aleppo but Kafr Hamra is likely to be a main effort for the rebels. In other reporting cited above it is noted that the rebels are pulling a lot of their men off the western Latakia front where they have been very engaged with R+6. These are among the forces that will undoubtedly be thrown into counter-attacks at Aleppo City. The decision on the part of the rebels to strip their western Latakia front is IMO indicative of rebel and/or Turkish belief that the outcome at Aleppo will be politically decisive in the outcome of the war especially in the context of the desperate internal situation now faced by Turkey. Surrenders of non-jihadi rebels now in the city are being facilitated by the government. That is likely to remove many fighter from the contest. My comment is that just within a week or two there seems have occurred a tremendous turnaround in Turkey's position on Syria. Only time will tell whether this will last or whether Erdogan is on the level. But at the moment the news in that regard is heartening. Well! The Syrian Army has struck a bonanza. SouthFront has the report today, replete with video and photos showing U.S. weapons. The Syrian Army has seized a major militant warehouse in the recently liberated Aleppo neighborhood of Bani Zeyd. Most of captured weapons are from the US and Turkey and include such things as advanced US anti-tank missiles and launchers (BGM-71 TOW). This might explain the rumor that the U.S. isn't supplying any more weapons to groups fighting in Syria [laughing]. "Terrorists Stand No Chance Against Assad as Turkey Sides With Russia on Syria"
Ankara has long supported radical groups fighting against Bashar al-Assad, but following a failed attempt to overthrow President Recep Tayyip Erdogan Turkey's upper echelons of power have had a change of heart, siding with Russia when it comes to the Syrian conflict, Deutsche Wirtschafts Nachrichten (DWN) reported. The online newspaper pointed to the fact that Turkish authorities closed the country's only official border crossing with the rebel-held province of Idlib, Bab al-Hawa [Nusra Front's stronghold], after the botched coup as evidence of a foreign policy U-turn. The media outlet further noted that this decision could be interpreted as Ankara having closed its border with the neighboring war-torn country, something that the international community has long called for. Radical groups, including Daesh, al-Nusra Front and the like have used Turkey's porous border with Syria to smuggle fighters, weapons and supplies in and out of the battlefield. But it appears to have become increasingly hard to do so. "Mercenaries, who until recently received support [from the outside], hardly stand a chance against President Bashar al-Assad," the media outlet noted. Earlier this month, Turkey signaled that it wanted to improve its relations with Syria. "It is our greatest and irrevocable goal: Developing good relations with Syria and Iraq, and all our neighbors that surround the Mediterranean and the Black Sea," Turkish Prime Minister Binali Yildirim said on July 13. "We normalized relations with Russia and Israel. I'm sure we will normalize relations with Syria as well." These comments and other remarks made by Turkish officials came as a sharp contrast to Ankara's previous stance on the embattled Arab country. In the months following the outbreak of the Syrian conflict, Erdogan and his supporters provided assistance to groups trying to overthrow al-Assad, once an ally of the Turkish president. Turkey's new strategy in Syria has "greatly contributed" to Moscow and Damascus' efforts to push the militants from Aleppo, one the most populous cities in the country, DWN asserted. In the last 24 hours, Daesh and al-Nusra Front fighters shelled several areas in Aleppo, including the Kostello trade center, as well as the neighborhoods of al-Zahraa, al-Khalidiyah, Leramon and Sheikh Maqsood, the Russian Centre for reconciliation of opposing sides in the Syrian Arab Republic reported on Saturday. Meanwhile, 169 civilians and 69 rebel fighters who agreed to lay down their weapons have left Aleppo through four safe corridors opened by the Syrian Arab Army as part of a major humanitarian operation launched by Moscow and Damascus. "We are feeling good now because we are under the protection of the army, may God protect them. We suffered a lot in order to be able to come here," the Associated Press quoted a Syrian woman as telling state TV. Some 7,000 armed police in heavy vehicles surrounded the Incirlik air base used by NATO forces in Adana in what a Turkish minister called a “security check.” With no official explanation, speculations have arisen about a new coup attempt or VIP visit. Hurriyet reported earlier that Adana police had been tipped off about a new coup attempt, and forces were immediately alerted. The entrance to the base was closed off. Turkey’s minister for EU Affairs downplayed the situation in a Twitter post, saying a “security inspection” was carried out. Is CNN's Michael Smerconish worried he'll be called a neo-McCarthyite? Michael Smerconish has given Russia expert Dr Stephen F. Cohen a short hearing about the New Cold War. Not only that, news of the interview, aired on Saturday, made it onto Google News late last night. Well well. Did Mr Smerconish and CNN brass get around to reading The Saker's letter? But it's more likely they're worried they'll be called McCarthyites because Steve's remarks about the New Cold War seemed to be news to Smerconish, who in defense of CNN explicitly stated that he, for one, was giving the remarks a hearing. At one point Steve says, "James Clapper. I don't know who hacked." He was referring to DNI Clapper's remarks on Friday that Washington still didn't know who was responsible for the hacking of Democratic National Committee emails and that the "reactionary mode" of automatically blaming Russia should be halted. Cohen says the media at large is doing a huge disservice to the American people by ignoring the substance of Trump's arguments about NATO and Russia, and buying the Clinton campaign's simplistic smear that Trump is a Russian "Manchurian candidate." "That reckless branding of Trump as a Russian agent, most of it is coming from the Clinton campaign," Cohen said. "And they really need to stop." "We're approaching a Cuban Missile Crisis level nuclear confrontation with Russia," he explained. "And there is absolutely no discussion, no debate, about this in the American media." "Then along comes, unexpectedly, Donald Trump," he continued, "Who says he wants to end the New Cold War, and cooperate with Russia in various places... and -- astonishingly -- the media is full of what only can be called neo-McCarthyite charges that he is a Russian agent, that he is a Manchurian candidate, and that he is Putin's client." "This is a moment when there should be, in a presidential year, a debate," he said. "And that is not what we are given in the media today." "Let's go back to what you said Trump said about NATO," Cohen also said. "Trump said early on, he wanted to know, 60 years after its foundation, what was NATO's mission today. 100 policy wonks in Washington since the end of the Soviet Union, 25 years ago, have asked the same question. Is NATO an organization in search of a mission?" "That's a legitimate question -- but we don't debate it. We don't ask it. We just say, oh, Trump wants to abandon NATO." MICHAEL SMERCONISH, CNN: When looking to blame someone for the cyberattack [against Hillary Clinton an the DNC], Russia was more than convenient. Is this a new cold war or political pot-stirring? Does this accusation have any basis in fact, and if not, could it cause real harm? Here to discuss is Stephen F. Cohen, American scholar of Russian studies at both Princeton and New York Universities. Professor Cohen, does Vladimir Putin indeed have a dog in our U.S. [election]? "We're in a new and more dangerous Cold War with Russia." We're approaching a Cuban Missile Crisis nuclear confrontation with Russia, both along Russia's borders and possibly over Syria. There is absolutely no discussion, no debate, about this in the American media -- including, forgive me, on CNN. Then along comes (unexpectedly) Donald Trump, who says something that suggests he wants to end the new Cold War, cooperate with Russia in various places. What we used to call detente, and now --astonishingly-- the media is full of what only can be called neo-McCarthyite charges that he is a Russian agent, that he is a Manchurian candidate, and that he is Putin's client. So the real danger is what's being done to our own poltical process. This is a moment when there should be, in a presidential year, a debate. Because Mrs. Clinton's position on Russia seems to be very different [than Mr. Trump's]; has been a long time. Trump speaks eliptically. You've got to piece together what he says. But he seems to want a new American policy toward Russia. And considering the danger I think we, as American citizens, deserve that debate, and not what we are given in the media today, including on the front page of the "New York Times." I end by saying that this reckless branding of Trump as a Russian agent -- most of it is coming from the Clinton campaign and they really need to stop. SMERICONISH: Okay. I don't know where to begin in unpacking all that you just offered to us. But I guess I'll start as follows. As one who can't match your credentials, here's what I see from the outside looking in. I see Donald Trump having said to the "New York Times," just within the last ten days, that he's not so sure he would stand with NATO allies, and I'm paraphrasing, he would want to know whether they would be pulling their own weight. The inpart of his comments seems to suggest he could provide Putin with unfettered, undeterred access to the Baltic states -- whose independence he resents. So it all seems to fit, therefore, that Putin would have a dog in this fight, would want to see Donald Trump win this election so that he, Putin, could do as he pleases, in that part of the world. CNN is covering that. I have to defend the network in that regard. But why does that not all fit, and why does it not all fit in the headline in today's "New York Times," which says Russian spies said to have hacked Clinton's bid. COHEN: "Said to have." Said to have. That's not news, that's an allegation. James Clapper. I don't know who hacked. Everybody hacks everybody. I mean, we hacked into Chancellor Merkel's cell phone. We learned that from Snowden. The Israelis hack, the America. Everybody hacks. The point is, and I know you said it, not to defend it, but as a provocation, that let's take the position you just set out. That Putin wants to end the independence in Baltic states. There is no evidence for that. None whatsoever. The point is, is that on the networks -- and I'm not blaming CNN, and there's none on any network. There is none in the "New York Times." I am old enough to remember that during the last Cold War, all these issues were debated in that you had a proponent to each point of view. But you have now got accusations, both against Putin, both against Trump, which needed to be debated. The most -- let's go back to what you said -- Trump said about NATO. Trump said early on, he wanted to know, 60 years after its foundation, what was NATO's mission today. 100 policy wonks in Washington since the end of the Soviet Union, 25 years ago, have asked the same question. Is NATO an organization in search of a mission? For example, it's a mission for the last 20 years was to expand ever closer to Russia. So people have now asked why isn't it fighting international terrorism? That's a legitimate question --but we don't debate it. We don't ask it. We just say, oh, Trump wants to abandon NATO. I don't defend Trump. Trump raises questions. And instead of giving answer to the substance of the question, we denounce him as some kind of Kremlin agent. That's bad for our politics, but still worse, given the danger we're not addressing it. (1) The letter, according to what Dmitri Orlov, one of the letter's signers, told Max Keiser recently, has by now been seen by about a half million people, if I recall correctly. Well, many more people would know about it because John Batchelor read parts of the letter on his radio show, which reaches millions here in the USA and around the world, shortly after it was published on June 1. Even so, that's not enough people who need to become acquainted with the idea that the U.S. policy of trying to push Russia into an existential quandary would be quite literally suicidal if successful. As to whether Hillary Clinton has also read the letter, let me put it this way. Mrs Clinton doesn't know what pushing means because she doesn't recognize lines. This explains how she's able to make up her own reality as she goes along. For example, years ago she got it into her head to depose Bashar al-Assad as a present to Israel. The problem being that the last thing Jerusalem wanted was Assad deposed. A cynic would say that Clinton was simply lying, that actually she intended to depose Assad as a present to Al Saud but wanted to blame it on Israel. But that's it -- if there are no lines, there is no lying. The problem being that people who create their own reality assume everyone else does the same. Which is to say that even if she read The Saker's letter she'd assume the Russian government wouldn't really nuke anybody. There is an *unconfirmed* rumor coming from the Russian Defense Ministry that ALL weapon supplies from outside Syria to the rebels have stopped. Obama/Kerry admitting defeat? Yes, that is what these creatures do. They are methodically destroying the United States from inside. I doubt many people outside the USA have sympathy for this but it's hard on Americans who love their country to see what's happening, and with no way of stopping it. All right, let me compose myself. I'll be back. Nusra: "A story of rats trying to pass for fluffy white rabbits." But who are the biggest rats? The report is a largely a summary of official reactions from Russia and the USA to Nusra's attempt to pass themselves off as moderates by distancing themselves from al Qaeda, which has fooled no one. However, Sputnik makes a few points that have not been reported in the Western news media. Before I highlight these I want correct Sputnik on a mistake that has been made by every press outlet I've read that has reported on the story. To my knowledge only Long War Journal picked up on the mistake, which is that Nusra didn't exactly say they'd broken with al Qaeda. Abu Muhammad al Julani, the emir of Al Nusrah Front, delivered a short statement today concerning his organization’s future. He read his message in a video that was rebroadcasted by television stations throughout the Middle East, publicly showing his face for first time. In previous appearances on Al Jazeera and other stations, Julani’s image was obscured. 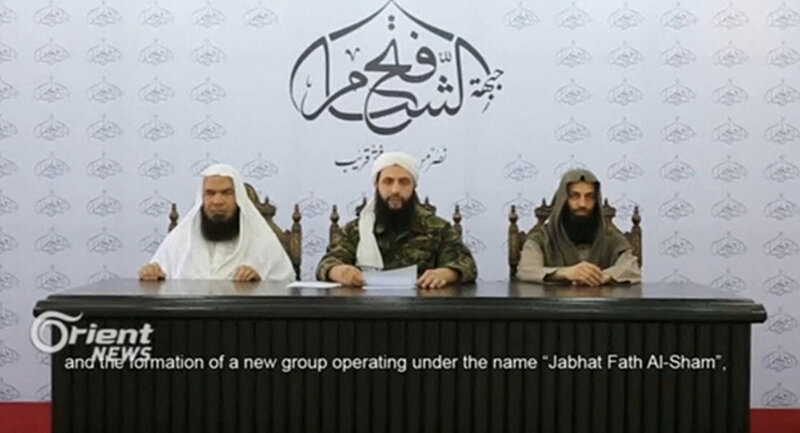 Julani’s group will no longer be known as Jabhat al Nusrah (or Al Nusrah Front), but instead as Jabhat Fath Al Sham (“Conquest of the Levant Front”). The move is being spun in press reports around the globe as Al Nusrah’s official “break” or “split” from al Qaeda. Julani did not explicitly say that Al Nusrah had broken or split from al Qaeda, which is the language used by the press. He made no such claims. Instead, Julani said Jabhat Fath Al Sham would have “no affiliation to any external [or foreign] entity.” If Julani wanted to argue that he and his men no longer had any ties to al Qaeda, he could have said so. He didn’t. And his precise wording allows for a considerable amount of wiggle room. [...] Middle East expert Semyon Bagasarov pointed out that Nusra Front leader Abu Mohammad al-Julani has been actively working to present himself and his group as a moderate, with the Persian Gulf nation of Qatar effectively supporting this line. According to Bagdasarov, the Nusra Front may not have managed to capture as much territory as Daesh, but the territory they do have under their control is more strategically significant than much of the vast empty space controlled by Daesh in Syria's eastern regions. Specifically, the Syrian province of Idlib, bordering Turkey, was intended to be the site of the Nusra Front's own caliphate. And according to the expert, they're not going to give up on that effort. "In this situation, it's very important for the group that the UN does not consider it a terrorist group, and one associated with al-Qaeda at that," Bagdasarov added. For its part, al-Qaeda appeared to have realized that not all was going well for their Syrian franchise. On the eve of the break, al-Qaeda leader Ayman al-Zawahiri issued a statement where the Nusra Front was given the right to act with more autonomy. If fact, according to Bagdasarov, the two groups may have even agreed to the formal split. According to the expert, the attempt at rebranding "seems at first glance to have been a simple, even primitive calculation that having split with al-Qaeda and changed its name, the terror group would fall out of the list of terrorist organizations. After that, the logic went, it could even be counted among the 'moderate' Syrian opposition, and included in the Geneva peace talks." Unfortunately, according to Yuri Bialy, vice president of the Moscow-based Experimental Creative Center Foundation, Nusra may have some success on this front. The terror group, he noted, is counting on receiving support not just from some Arab countries (Saudi Arabia in particular) but even from some Western powers, including France and the UK. In other words, without Russia's military intervention absolutely nothing in Syria would have a chance to change because the United States of America and its European and Gulf allies have wanted to destroy Syria and raise in its place a Middle Eastern version of the Balkan countries -- where Western and Gulf powers will share in control of regions administered by proxy Islamist rulers. For his part, Dmitri Abzalov, the director of the Center for Strategic Communications, pointed out that even direct violent clashes between the Nusra Front and Daesh have not prevented the two groups from cooperating in the economic sphere. "For a long time, the Nusra Front controlled a large portion of the Syrian-Turkish border, through which the oil caravans produced on Daesh-occupied territory made their way to Turkey. Throughout this period, Nusra acted as a kind of commodities broker for Daesh, helping it to sell its black gold on commodities exchanges." Ultimately, Abzalov suggested that broadly speaking, the Nusra Front, or 'Jabhat Fatah al-Sham', as it now prefers to call itself, has found itself in a much more difficult situation than Daesh [Islamic State]. If the militants of that [latter] group can freely escape Syria and head east for Iraq, Nusra is in a situation where they are being pressed against the Turkish border in their main base of support, the region of Idlib. "Taking into consideration the new relations between Turkey and Russia, the Islamists will no longer be able to count on Ankara's assistance. The last thing they will be able to hope for is a measure of leniency toward themselves, hence the attempt to soften their radical positions. Therefore, the renaming, and the renunciation of ties with al-Qaeda really suggests that the group is in its death throes." Accordingly, Abzalov noted, the terrorists' rebranding effort indicates that the situation in Syria is beginning to improve in a fundamental way. Moreover, even if Julani did say that his group had really split from al Qaeda (which he didn’t), there is no good reason to believe him. Julani himself noted that Al Nusrah’s rebranding was necessary to obscure the vision of its enemies, especially the US and Russia. In addition, al Qaeda’s leaders have long sought to mask the extent of their influence in order to minimize Western scrutiny. Long War Journal has pounded away at that last point to anyone who would listen, including Members of the U.S. Congress. But LWJ has been going through what top counterterrorism expert Youssef Bodansky went through for years, until he finally gave up and holed up at Gregory Copley's Defense & Foreign Affairs. No matter how many times Seffy explained, no matter how much data he dredged up, Members of Congress and the U.S. National Security Council would read his reports then say, 'Uh uh, uh huh,' then continue on with no change -- even after 9/11. Even after 9/11, do you understand me? So I'm not as hopeful as Abzalov. Barack Obama, for all his horrific mistakes in defense policy, has been playing the role of the Maginot Line to prevent the utter destruction of Syria by U.S-NATO factions and the Gulf powers. The virtually impregnable line of fortifications, as history tells us, was eventually outflanked by the Nazi army. After struggling through Wikipedia's account of the tortured dissections by opera experts of Maria Callas's impossible-to-analyze voice, I felt myself like the man who, wearying of a discourse on astronomy, stumbled from the lecture hall to gaze in silent wonder at the night sky. Here, Callas sings the role of a daughter pleading with her father not to allow a feud to separate her from the man she loves. "O mio babbino caro" ("Oh My Beloved Father") from Puccini's Gianni Schicchi. "Terrorists Laying Down Arms in Aleppo as President Assad Offers Amnesty"
These amnesties have been offered for years by the Syrian government but from all the reports I've seen of these agreements this year, I think the pace of fighters taking up the offer increased after Russia joined the war. The reason isn't always fear; it's also seeing light at the end of tunnel -- a growing conviction or hope that the Syrian government is strong enough with Russia's help to restore peace to the country. TEHRAN (FNA)- A large number of terrorists laid down arms and surrendered to Syrian army in Aleppo province as the soldiers of president Bashar al-Assad are racing towards Aleppo after completing siege of the city and capturing the most vital stronghold of the militants in the region, Bani Zeid. "Scores of Takfiri militants laid down arms and turned themselves in to the Syrian army in Bani Zeid and al-Lairamoun to be pardoned," a battlefield source said on Thursday. "The move by the terrorists in Aleppo province came after army troops put the militants to rout in Bani Zeid and al-Lairamoun and completed the siege of Aleppo city in the East," the source added. Forces loyal to president Assad took full control of Bani Zeid in the Eastern parts of Aleppo on Thursday. They also managed to recapture all building blocks, firms and factories in al-Lairamoun industrial zone in Northern Aleppo province. The Syria army and popular forces had also managed to cut off all the supply lines and passages used by the terrorists to move from the North to the Eastern neighborhoods of Aleppo city on Wednesday. Local sources said Thursday terrorists in the besieged districts of Aleppo have blocked the “safe passages” provided by the Syrian Army for the civilians to leave the militant-held districts in Syria’s second-largest city. Lebanon’s Al Mayadeen TV channel reported the move by the terrorists in Aleppo came after a large number of people, including civilians and militants who decided to lay down their arms abiding new offer of amnesty by the Syrian government, left the city of Aleppo through ‘safe corridors’ provided by Syrian pro-government forces. Some reports also suggest militants groups have employed snipers to shoot many people getting through the 'safe passages'. Syrian state television quoted the governor of Aleppo as saying that three humanitarian corridors have been established for civilians to leave the city. President Bashar Assad also offered an amnesty for rebels who surrender within three months. Russian Defence Minister Sergei Shoigu also said a fourth corridor would be set up in the North of the city for militants, near the Castello road which the army recently took over. The Syrian army said on Wednesday it had dropped thousands of leaflets over militant-held districts in Aleppo, asking residents to cooperate with the military and calling on militants to surrender. The question before me is how many movies did the Democrats show during their presidential nomination convention this week? And why no popcorn distributed to the convention attendees? I've heard of the Hollywoodization of politics but this is ridiculous. There was a movie about Tim Kaine to introduce his VP acceptance speech at the Democratic National Convention this week. There was a movie about Barack Obama to introduce his speech to the convention. There was a movie about Hillary Clinton to introduce her acceptance speech. Was there a movie about Michelle Obama to introduce her speech to the convention? Give me a moment to check. Yup, there was. What about Joe Biden? The Joe Biden DNC Introduction Video Displayed His Moving History Of Public Service - VIDEO. As you can see not only was there a movie shown at the convention to introduce his speech to the convention, but it was also picked up by at least one website. All right, what other speakers at the DNC were introduced with a movie about them? Maybe I'm going about this wrong. I should just ask whether every major speaker at the Democratic National Convention was introduced with a movie about the speaker. To make it even simpler -- just exactly how many movies were shown during the four days at the convention? To really boil it down, how many attention-challenged people does the Democratic National Committee think make up today's Democratic Party? Well there's only one way I can think to try and salvage a post about the Democratic Party's version of Sunset Boulevard. Here's the podcast of Dr Stephen F. Cohen's discussion on Tuesday's John Batchelor Show about the latest machinations of the Get Russia crowd. 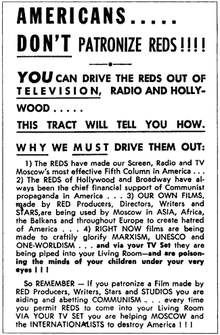 These include a serious attempt to resurrect McCarthyism in the USA. Also: Neo-McCarthyism and Olympic Politics as More Evidence of a New Cold War; Stephen F. Cohen; July 27, The Nation: McCarthyism was a characteristic feature of the preceding Cold War, but now it is coming from liberals, even from the Clinton campaign. See how nicely it all strings together. Hillary Clinton. Hollywood. The Red Trump Scare. Attention-Deficit Democrats. Observe Ustad Nusrat Fateh Ali Khan's gestures and expressions as he sings the following qawwal. Note how intently the qawwali singers on the stage listen to each other. They have to listen; the kind of singing they're doing is based on call and response -- the most ancient form of song. If you have a loved one who persistently won't listen when you speak, fix on the major point you're trying to communicate, then sing it to the person. Also, there are people who want to pray but feel they can't. If you know someone with this problem tell him to try singing his prayer. If he says he can't carry a tune, this is not a Puccini aria he's trying for. Tell him singing is as natural as breathing; if the person doesn't believe you, have him to watch two videos of Ustad Nusrat & Party and call you in the morning. Ready? This qawwal, "Yadan Vichre Sajan Dian Aiyan," was sung in Islamabad in 1989. As to the meaning of the words, how should I know? It's a Sufi devotional song. Use your imagination. Wednesday, July 27, 2016 06:39PM SANTA CLARITA, Calif. (KABC) -- The Sand Fire, which has burned more than 38,000 acres in the Santa Clarita area, is now 40 percent contained, according to fire officials. It has charred approximately 38,346 acres as of the latest fire update Wednesday. Firefighters are hopeful to continue gaining an upper hand on the fire, but high heat and winds in the afternoon could hamper efforts. "Today's temps are going to be high. It's going to be around 100 degrees. Winds are going to be around 25 mph. These conditions are perfect conditions for rapid fire growth," said Justin Correll, spokesman for U.S. Forest Service. Acting Gov. Tom Torlakson declared a state of emergency Tuesday evening for Los Angeles County to provide more resources to firefighters and aid to victims. Nearly 3,000 firefighters from multiple agencies work day and night to calm the blaze, which quickly exploded when it first broke out Friday afternoon. At one point, the fast-moving wildfire threatened thousands of homes and caused 20,000 residents to evacuate. On Monday night, most of them were allowed to go back home. While firefighters are gaining the upper hand in the fight, officials said they still have 60 percent of the fire to contain. Fire officials are also asking people to stop operating drones in the area, which has hampered firefighting efforts from time to time. Lisa said she was amazed at how happy the dogs were. She asked about the "problem dogs," who tended to be nervous around strangers. The inmates told her they didn't have any problems. "[They] were thriving under their care," Lisa said. "[They] had wagging tales and smiles on their faces." Nearly 50 deaf dogs threatened by the Sand Fire have found a temporary home: behind bars. The rescue[d] dogs are waiting out the fire in the Lancaster prison. The owners of Deaf Dog Rescue of America decided to evacuate the animals from their Santa Clarita kennel Sunday night, after the fire started moving closer and closer to the property. Though they were not under mandatory evacuation, Mark and Lisa Tipton decided they were better safe than sorry. "We knew if we had an issue in the middle of the night, [we] would be here alone with 45 dogs to load up," she posted on the rescue's Facebook page. "Not a can-do." But the Tiptons had a hard time finding a place that could hold all of their animals, which they've rescued from across the U.S. They were ultimately invited to bring them all to the prison, where Mark Tipton operates a dog training program, Karma Rescue. "We arrived to find the man-cages ready for the dogs," Lisa Tipton said, with "food, water, beds, and igloos." The couple returned to their home Sunday night, planning to show up at the prison for the dogs' breakfast the next day. Lisa said she was amazed at what she saw when they arrived. "The inmates had handled breakfast beautifully," she said. "They were getting the dogs out for exercise and cleaning their runs... I have never, ever seen anyone clean up dog poop with such glee." The dogs, even the ones that aren't always comfortable around strangers, were just as happy, she said. "[They] were thriving under their care," she said, "and had wagging tales and smiles on their faces." The Tiptons said they're happy their dogs had such a warm welcome. "To see incarcerated men of all races working so beautifully together to help others is a really amazing experience," Lisa Tipton said. "If they had turned us away, with 97 degree [heat], we would've had dead dogs in the trailer." The dogs will likely stay in the prison through the end of the week, until the fire is more contained. Now the rescue organization is looking for donations to cover the expenses of moving the dogs. You can donate to the shelter on their website. Prepare yourself for shocks as you listen to Tonelson if you have bought the argument that the United States controls the WTO and uses it to further its export regime. The truth is just the opposite, and the truth is why Donald Trump wants the United States out of the WTO. There would be some urgency for this, given that the same trade-driven debts that underlaid the last economic crash have been building up again to an alarming level. Why, then, any rational person would ask, have the Powers That Be in the USA been such strong defenders of WTO if it's so harmful to American economic interests -- and indeed the interests of international stability? Part of the answer is that WTO membership locks the United States into an import regime, which is very profitable for certain segments of business and finance. The other part is that the WTO, which was conceived as impartial and nonpolitical, is anything but. It is a cash cow for every political faction and business lobbying group in WTO member countries. That is why the World Trade Organization became one of the props of the strange 'shadow governments' that have appeared in many nations around the world -- a problem of modern democracies that anti-globalists invariably blame on central banks and big international banks. It's more complicated than that, as Alan Tonelson, and Donald Trump, well know. But the biggest question is whether Republicans understand all this. Mr Trump has to do a better job of explaining himself at some point before voting day. Here is the podcast for Tonelson's discussion; it starts at the 11:20 minute mark. And here is the link to Tonelson's well-named website, RealityChek.com. "Ansarullah Starts March on Saudi Soil"
When will U.S. heatwave end? Not anytime soon. I think it's "Pata Pata" time again! ﻿"For those who say they don't understand"